For those vacationing in the Benidorm area until 31 July 2014, you can get tickets to the Aqua Natura water park with a 50% discount: you will pay £10 (approximately €13) instead of €26. Discounted tickets are available for purchase until 30 June and must be used until 31 July 2014. These tickets are sold by TravelBird, a fast growing travel agency. Once you made the purchase, you will receive the vouchers by e-mail. You must print those vouchers and show them at the ticket office at the entrance in the water park. This is a summer sale from Hyatt properties in Dubai, United Arab Emirates. When you stay more than two nights, the last night of the stay is for free. Prices per night are adjusted to account for the free night (that means that for a 3 night stay, for example, you will pay 33% less per night). The deal is even better at Hyatt Capital Gate in Abu Dhabi and Park Hyatt Abu Dhabi Hotel and Villas, where you get a free night also when you stay only 2 nights, thus resulting in an actual 50% discount. Rates are flexible, allowing cancellation up to 24 hours before arrival. For bookings until 27 June 2014, you benefit from 40% discount on room rates plus free breakfast at Mercure, Novotel, Sofitel, Mgallery Collection, Pullman hotels worldwide. In order to get 40% discount, you must be a member of their loyaltly programme, otherwise the discount is 30% for non-members. These special rates are valid for stays from 11 July 2014 to 31 August 2014. In UK the deal is even better, as it is valid for stays until 22 February 2015. In Benelux the stay period goes until 30 September 2014. These rates are non-refundable, so book only if you are certain of your travel dates. AirFastTickets is one of the cheapest online travel agencies for flight bookings. For bookings made this week-end (travel throughout the year), you get 20€ off tickets of minimum 100€. The offer is made by the German version of AirFastTickets, which shows better prices than its UK sister website. If you do not speak German, make also a mock reservation on the UK version of AirFastTickets, but finalise the transaction only on the German website. Use the AirFastTickets coupon code in the last page of the reservation process, in the section "Rabatt-Coupon", just above the passenger information. The promotion is valid for stays from now until 30 September 2014 (except the Aruba Resort, where the promotion begins on 1 July 2014). In the search results, this special rate is called "Sun, Sand and Double Points". Rates are flexible up until 2 days before check-in, so you can cancel before that day for free, if your plans change. This is an ongoing promotion for MGallery, Pullman, Novotel or Mercure hotels in Brazil, Argentina, Chile, Ecuador, Guatemala, Mexico, Panama and Peru. The last night of the stay is free when you book 4 nights at participating properties. 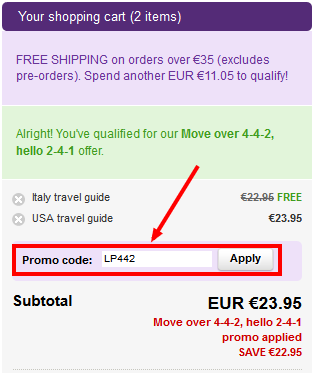 The promotional rate is shown as "4 nights = 3". Rates are flexible, so you can cancel free of charge, in case plans change. This is the newest promotion from Hyatt, to replace the 3 for 2 offer that just expired. Similarly to the previous offer, it is valid only for week-end stays of minimum 2 nights (arrival on a Friday or Saturday). The offer is valid for bookings until 29 June 2014, for stays between 27 June and 31 August 2014. In the search results, this promotion is shown as "Summer Special". Rates are flexible, so you can cancel in case plans change. - the "Summer Special" rate is about 20% less than the regular "Bed and Breakfast" rate, which represents more or less the value of breakfast. This promotion called "Dream Deals" just started today and offers between 30% and 40% discount (depending on the property and availability). These discounted rates at Radisson hotels are valid for booking until 20 June and stays until 15 September 2014. Rates are non-refundable, so book only if you are certain of your travel dates. This promotion called "Blockbuster Bonus" is offered by Club Carlson, the loyalty programme of Radisson Blu, Park Inn by Radisson, Park Plaza and Country Inns & Suites By Carlson. This promotion will double your points for a single night stay and triple your points for a minimum 2 night stay. For example, for a two night week-end (11-13 July 2014) at the Radisson Blu Hotel Beijing, a double room will have a total cost for 205$. Multiplied by 60 points per dollar spend under the current promotion, you will receive a total of 12 300 points, which is already enough for a free night at some of the Carlson Rezidor properties (for example, rooms at Park Inn Bratislava or Park Inn Reykjavik sell for 9 000 points per night). The promotion is valid for registration and stays until 31 August 2014. This deal is valid for print and electronic guides about the countries who will compete in the soccer competition in Brazil. The offer is valid for purchase until 13 July 2014. Atlantis the Palm Dubai is an ideal holiday spot for families with kids (see list of activities below). This discounted package at Atlantis resort makes such a holiday affordable. For example, three nights for a family of 2 adults and 2 kids starting on 26 June 2014 have a total price of approximately £930, including half-board. This is great value, considering that the half-board option alone would cost £600 in total, if booked separately (approximately £50 per person per night). P&O Ferries offers a £20 voucher to spend onboard, when you book a return crossing from Dover to Calais (the return date must be at least 5 days after the outward journey). The £20 food voucher will be distributed at check-in for use on the outward leg of the booking (in the Club lounge, Food Court or The Brasserie). The offer is valid for bookings until 23 June 2014 and travel until 30 September 2014. The offer excludes foot passengers, bicycles and coaches.